A UK court has delivered a stunning verdict on the dangers of the airbag, saying that when one was discharged, it split on a broken window, discharged a chemical that killed the driver, who had only slight injuries after the accident. The Coroner determined that the chemicals in the airbag poisoned the unfortunate driver, Ronald Smith, from S underland. He was involved in a six car accident in 2010, the airbag was activated, but punctured after the window in his car was smashed during the accident. Whilst Smith survived the accident he died a couple of months later from bronchial pneumonia, with his lungs showing clear signs of infection. The Coroner blamed the airbag, saying:- “This man died as a result of this incident, and more pointedly, because of the explosion of his airbag”. Apparently when the airbag exploded it emitted a large amount of ‘white powder’. Airbags inflate with a gas created by igniting a chemical called sodium azide, which is extremely toxic, so much so, in fact, that it is apparently comparable in its toxicity to cyanide. Whilst UK safety authorities acknowledge there could be a danger, they say it is “extremely small”. This is said to be the only recorded case in the UK. But they also said that the chemical that preceded sodium azide, nitrocellulose, was even more toxic and also highly inflammable! Modern cars now carry as many as nine airbags – could this mean there are nine toxic danger points? We’ll talk to the Australian car safety agencies and ask for their comments and let you know. Modern vehicles coddle their drivers with electronic ‘nannies,’ creature comforts that were unimaginable a few years ago and virtually trouble-free motoring. Not too many years ago an extended trip by automobile involved a great deal of preparation and the packing of emergency repair items. When is the last time a modern driver had a flat tire that had to be addressed on the roadside? Fixing a flat used to involve patching an inner-tube, after removing the punctured inflatable from the tire by the application of a pair of tire-irons and a mallet. Today a flat tire is confronted with a call to the motor club, or at worst, the removal of the offending tire and wheel and the installation of the spare tire. Clara E. Sipprell was a world renowned photographer. In her day, Clara captured the images of some of the world’s luminaries including: Albert Einstein, Eleanor Roosevelt, the great American poet Robert Frost, the royal family of Sweden, Igor Stanislavsky, Pearl Buck, Albert Schweitzer, Dag Hammerskold and many more. Aunt Clara wasn’t really my aunt, but she was part of my family for so many years that my siblings and I thought of her in that manner. 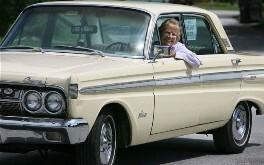 She loved fast, open cars, corncob pipes and strong drink. Clara’s automobile adventures were legendary, photographic safaris they might be called today. She would fill her touring car with equipment, cameras in the boot and tripods strapped to the sides and then set out on a trek across the USA or along the Croatian coast or on the Trans-Siberian Highway. She recorded these adventures on photographic plates, the subjects being most often the interesting people she encountered, but sometimes just the scenery. She used no artificial lighting, made only contact prints with no enlargement and did all of her own processing. Clara often said that the trip was the important part of her travels, not the destination. She truly loved to drive. Once while traveling across the USA, she was speeding through Georgia and the local police hauled her into a rural courtroom to face the judge. She and the judge got on famously and she was let off with a warning. On the return trip she detoured back through the little country town so she could continue her conversation with “his honor.” She liked people almost as much as driving. I imagine that Clara wouldn’t like the motoring as much today what with superhighways and the total reliability of vehicles. Part of the adventure of traveling in her day was a little bit of uncertainty. 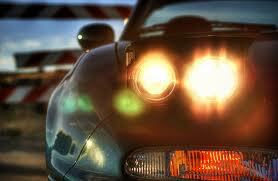 I’m talking about flashing your headlights as a warning against police activity, OK? A judge in Florida had to pass judgement in a case where a driver was prosecuted for flashing his lights to oncoming traffic to warn them of a radar trap. He got off, with the judge citing that the defendant was ‘engaging in behaviour protected by the US constitution’. Flat Battery? Certainly we can fix it, sir. That will be $45,000. Oh my God! How would you feel if you buy a new supercar, let the battery go flat and then get charged $45,000 to replace it? But that’s what’s happened to some owners of the new Tesla Roadster Electric Supercar. The car costs around $200,000 in Australia, is fully electric, with a range in a single charge of 400kms. and will accelerate to 100kph in under 4 secs. which sure is supercar territory. In fairness the maker does make it clear that the battery must not reach full discharge and that there are numerous warning signals. Despite that some owners have had to face the unbelievable – ” I’ve got a brick!”, a totally immobile vehicle that cannot be started or even pushed to the side of the road. The owner is forced to pay around $45,000 to replace the entire battery – and possibly a lot more if the car fails far from its home base in the USA, like the unfortunate owner who suffered severe shipping delays when he imported his car to Japan and it arrived with a flat battery! It seems that neither Tesla’s new car warranty nor normal car insurance policies provide any protection for the unfortunate owner. BUT HERE’S THE GOOD NEWS! That’s not symptomatic of electric cars, though keeping a charge in the battery is much like keeping oil in the engine or petrol in the tank for a normal car. The first experience that local buyers will have for an appoachably-priced electric car will probably be the Nissan Leaf, scheduled for sale this month. It has already been launched overseas and has had a launch event here, supported by a really interesting and award-winning ad campaign- World Without Petrol (and it’s worth a click through), which will probably be used for the public launch in Australia. THE GOOD NEWS is that if the battery does go flat it can be easily re-charged. There’s also plenty of warning that it’s running out of petrol-sorry, electricity. Finally, in some markets Nissan also offer a free ‘pick up and tow’ service, although that hasn’t yet been confirmed here (and Nissan HO were unavailable for comment). We’ll be telling you more about the new Nissan Leaf shortly, but it offers around 100-120 km range on a single charge, and it is expected that it will not need specialist charging points (it should be able to be done at home). It will be sold at a premium price to its petrol competitors at around $51,000. Bull Bars – A Load Of Bull? They would have to be one of the most common and the most visible car accessories. Here in Australia, we tend to call them roo bars rather than bull bars simply because we’re more likely to encounter Old Man Kangaroo in the middle of the road. But are bull bars, roo bars, nudge bars or whatever you want to call them really worth it? Should you install them on your vehicle? Opinion is, of course, divided, and whether you put them on your car or not is really up to you, the sort of car you have and what you plan on doing with it. There’s no denying that a set of big bull bars/roo bars have tough-guy good looks on a big 4×4 like a Mitsubishi Pajero – and that they look a bit silly on a little hatchback (although nudge bars might have a sort of ironic humour installed on a Mini) or on a sports car. But don’t just blindly get them put on your set of wheels. Think first. The idea behind bull bars is simple. If you’re driving down a country road at night and some stupid cattlebeast or kangaroo (or some other big animal) wanders out into the road as you bucket around a corner at the full legal limit, there’s going to be one heck of a big mess. You won’t be able to stop the mess that will be made of the poor dumb animal but the mess it makes of your front bonnet can be minimised if you have bull bars attached, as the bull bars take the impact better than the headlights. You can also get smaller versions that protect the front of your vehicle from the scrapes and bumps of shrubbery; these are usually called nudge bars, bush bars or brush bars. Bull bars also fit in very well with other off-road accessories, as they make a handy place to mount a winch or extra spotlights. However, bull bars have their downside. In fact, there’s noises going around about them being banned in the European Union, especially the metal ones. This is because if a car fitted with bull bars hits a pedestrian or a cyclist, all the force of the car is concentrated into the bull bar as it strikes the person, and the result is much worse than if the pedestrian or cyclist hit the bumper and the headlights – a person might be able to survive being hit by a car without bull bars but the chance of serious injury or death is much higher when the metal bull bars are there. Have a look at the ANCAP or other crash test sites and have a look at the tests for pedestrian safety and you’ll see why. These problems get worse if people pop accessories onto bull bars, such as winches, lights, fishing rod holders and the like, as the brackets can be sharp and act like a spear in a collision. Bull bars can also interfere with airbags, as it’s a hard blow on the bonnet that triggers the airbags to deploy. If the bull bars are put on in such a way that they deflect most of the force from the bonnet, the airbags might not go off during a head-on collision, which means the drivers and passengers are more likely to be injured. The verdict? If you do a lot of rural driving or off-roading, then roo bars will certainly save you a few panel beater’s bills. However, if you’re a mostly urban driver and just like the looks of them, it’s probably better if you leave them off for safety reasons. Those who want to fit bull bars to their new 4×4 can find out more about the Australian legal requirements at this link. Ever come across a car accident? Ever been in one? What about a serious one? I had an experience where a car following behind me shot across the middle of the road, hitting another car head on that was travelling in the opposite direction. Thankfully, the accident occurred in a 50 km/h zone, and no one was killed. I stopped, along with one or two others, to see what we could do. Both cars were write offs, and both drivers suffered severe shock. The driver that veered across the road had hit his head during the accident and had a head wound. At the time, there appeared no danger of fire, so we tried to calm both drivers down while waiting for the emergency services to arrive on the scene. Switching back and forth from groaning in pain and wanting to jump out of the car and split the scene, the driver in the wrong had possibly been driving under the influence of some drug. The lady in the other car was very shocked but unhurt. In the last couple of weeks, a friend of ours was driving down a main road, again in a 50 km/h zone, and a young boy ran straight out in front of the car. Even the driver travelling behind our friend, who witnessed the accident, said there was very little our friend could do. Sadly the boy died soon after the impact. Has anyone had an experience where your car just stopped and wouldn’t start? It’s bad enough having this happen in the middle of the daytime in busy city streets, but it really stinks when this happens on a cold wet night along ways from anywhere! So what things can we carry in our cars that will help us in an emergency situation? It is, definitely a good idea to carry some water and food with you if you are heading out of town. It isn’t too difficult to keep a couple of litres of water in the boot of the car that you can drink or use for topping up a leaking radiator. Having a blanket or two in the back of the car isn’t a silly idea, either. Carry some warm clothing with you – like a jacket and hat. Some of the late model cars come with an emergency kit already provided, inside the boot or cabin. 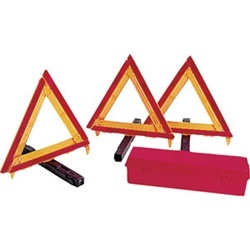 This might consist of a night reflective sign indicating to oncoming drivers to slow down, a high-viz vest and a heat preserving blanket. Nowadays having a cellphone with you is a great addition to any travel plans. If you travel through areas that are somewhat unpopulated, having a cellphone with you is even more essential. Consider picking up a car cellphone charger, too. Cell phone signals travel on a line of sight from towers, so if you’re in hilly areas or valleys you’re likely to strike terrible reception. If bad reception occurs, try getting yourself to higher ground, as this often helps. Go to any major shopping centre, and you’re sure to find a place selling a first aid kit. These have things like bandages, ointment, scissors, tape, plasters, and surgical gloves. You really should have one of these in your car. Many of the first aid kits can slide under the front seats so that little room is taken up. Don’t forget to take any medication that you or your passengers may need for a long journey. A torch is a must. And, have you thought of doing a first aid course or updating your old one? Here’s to your safe travels. She was sleek and curvaceous and there was almost a glow about her. She crouched under the spotlight looking as if ready to pounce on an unsuspecting admirer like me. Her skin was smooth and flawless. I walked around her admiring the curve of her flanks and the rounded rear. It was love at first sight for me and I could hardly wait to know her intimately. My first Ferrari experience was about to begin. Most of us will go a lifetime without ever driving a truly high-performance car, let alone a supercar like a Ferrari, Maserati or Lamborghini. I was one of those fortunate ones who, without making the huge investment, got to enjoy a number of drives in a truly great car. I was the new sales manager for an old Ford dealership. The owner was a high-performance car enthusiast and we were one of the few dealerships that inventoried and sold the limited production vehicles produced by Ford Racing Division. One of our high-performance salesmen was a former racing driver, Paul O’Shea, who had been with both the Ferrari and Mercedes-Benz teams in the nineteen-fifties. Paul had located and bought with the boss’ money, a retired Ferrari Gran Prix car that had once won the Carrera Pan-America, the Gran Prix of Argentina. The Ferrari red body was crafted of aluminum, light and easily dented. It was right-hand drive with a headrest that sloped back into the rear deck. Next to the base of the headrest buttress was the huge, spring-loaded cover for the sixty gallon gas tank. Originally equipped with a Ferrari V-12 of about four litres, the car had been bought for a pittance with a rod through the aluminum block. Not being a purist, though he did own two other Ferraris, the Ford dealer had the shop install a Ford seven litre racing engine with a highrise manifold and two, huge four-barrel carburetors. Blueprinted, the Ford engine produced 575 horsepower in a vehicle that weighted about 1,900 pounds with sixty gallons of gas aboard. It was awesome! The clutch was very heavily sprung and hard to depress at first, but once underway it was fast and had a very positive grip. The shop had rigged an Austin-Healey windshield in place of the tiny windscreen that had sufficed for racing. The red beast looked street legal, but lacked windshield wipers a horn and a few other unmentionables that would have passed a motor vehicle inspection. It was important not to attract the attention of the traffic policemen while operating on the public roadways. I drove the red beauty every chance I got, the excuse being that I was promoting our High-Performance Division. I drove it to the gym, picked up my girlfriend for lunch and cruised the local drag-racing strip parking lots. My romance ended when my promotional drives produced results; the sale of twelve racing Fords and one former Ferrari race car. How Reliable Will My New Car Be? 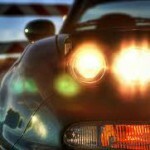 We have written about car reliability surveys on our web site here. Some car enthusiasts hate bumper stickers – they spoil the clean lines and detract from the overall design of their machines, and if you change your mind about the sticker and you put it on the paintwork (bad, bad move), the paintwork can get damaged. The only stickers you’re ever going to see on machines owned by these people are the little tags that all cars have to have to tell those passing by and inspecting them that the car is road legal and all the paperwork has been done and paid for. Plus a few little stickers in obscure parts of the window about the security system installed. For other people, however, car bumpers and car rear windows are a blank canvas to express creativity and personality – and a sense of humour. In extreme cases, you won’t just find bumper stickers but also things that attach by suction cups onto the rear windows and possibly fuzzy dice or rosaries hanging from the rear view mirror. At the least creative end of the spectrum, you have those “Baby on Board” stickers or suction-cup thingies, warning anyone driving by that there is an occupied child seat in the back. These things were originally marketed as being a safety item, with the idea that if people saw them, they’d slow down and be more considerate. This isn’t the case, especially as you can now get rip-off versions of these than inform the world that you have a certain breed of dog on board – which is likely to be obvious if the windows are down and your Irish Terrier, German Shepherd or whatever is putting its head out the window to catch the breeze (impressive in a long-eared, long-haired breed like the Afghan Hound). At the other end of the spectrum, you get stickers with pictures and slogans. Few cars in Australia come close to the sticker-mania of taxi drivers in Peru back in the early 1990s (yes, this writer was there then and rode in them). It wasn’t the outside but the inside of the taxi (usually owned by a freelance driver and usually one of the classic old VW Beetles) that was covered with stickers with all sorts of jokes and witticisms on them, usually slightly indecent. Or very indecent, but my Spanish wasn’t that good. The stickers were probably there to distract you from the overall poor condition of the vehicle and the bad driving. Or maybe the taxi driver just liked to look at them while waiting for a fare. Bumper stickers tend to come in two main types: those that make a political statement and indicate the good cause supported or the opinion held by the driver/owner of the car. This includes stickers that promote or advertise products (not including company logos). The other type includes witticisms and tends display a sense of humour. The political/good cause type of sticker can express nearly opinion under the sun and range from the discreet (small fish signs indicating that the driver is a Christian) through to large and eye-catching. • When I grow up, I want to be a BMW. (Seen on a very small hatchback). • I used to be a Range Rover, but I shrank in the wash. (Ditto). • Help! Dad just farted and we’re trapped! • Don’t follow me – I’m lost, too. 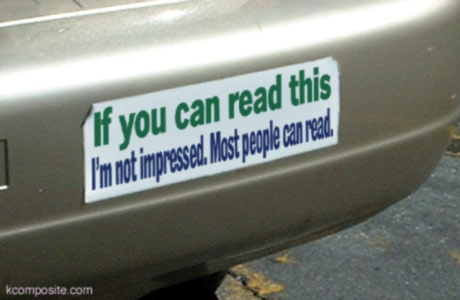 What are favourite stickers spotted or put on the cars of readers? Send us through the good ‘uns for us all to enjoy (preferably clean – this is supposed to be a family-friendly site!). On the site here we wrote an article about the cars that have done the most kilometers in the world. We werent sure of the Australian record, so please let us know in the comments below if you know of a record breaker or near record breaker odometers.